Macaffer's emotional speech to the players Watch the retiring Brent Macaffer address the Collingwood players, coaches and staff as he announces that season 2016 will be his last at AFL level. Alan Toovey played 159 games for Collingwood between 2007 and 2016. From the rookie list to premiership success, Brent Macaffer and Alan Toovey have called time on their football careers. The pair has shared many challenges and triumphs over the past decade and endeared themselves to Collingwood fans. Macaffer began his AFL career in a memorable way, securing his first senior game as a late inclusion on ANZAC Day in 2009 and kicking a goal with his first kick. Pick No. 26 in the 2007 Rookie Draft, Macaffer took his chances when they presented over the next 18 months and found himself a premiership player at the conclusion of the 2010 season. Two knee reconstructions in three years (2012 and 2014) halted the 28 year old’s career but in between setbacks his reinvention as a tagger produced a break out year in 2013 where he was shutting down some of the game’s most respected midfielders. Throughout his 77 games, Macaffer secured a premiership medallion, finished fifth in the club’s 2014 best and fairest and was named in the club’s five-man leadership group this year. Coach Nathan Buckley said Macaffer’s career has thrown everything at him. “His growth as a person through it all has been significant. He played many roles in his time and gave everything he had to them,” Buckley said. A farewell from the premiership captain. Photo: Collingwood Media. “Above all, his care and support for his teammates endeared them to him and he became a strong leader as a result." Toovey’s football journey has spanned over a decade and includes 159 games for Collingwood. A fan favourite, the Collingwood army’s affectionate chant of ‘Toooovs’ echoed around the MCG every time the defender ran off half back with the ball in hand. Selected at pick No. 2 in the 2006 Rookie Draft, the West Australian wasted little time making his mark, earning his senior debut in Round 3 the following year. Consistency and tenacity meant Toovey quickly became a vital cog in Collingwood’s backline, continually shutting down some of the games’ best small forwards. Toovey was a member of the 2010 premiership team and received the highly-regarded Darren Millane Award as best clubman in 2012 before a knee injury cruelled his 2013 season. Buckley described Toovey as reliable, dependable, selfless and an absolute competitor. “Alan achieved the ideal of being a great teammate from his first game and carried on for 11 seasons,” Buckley said. “Tooves’ contribution to his team was consistent effort and attitude and you knew he would just get the job done...every time." 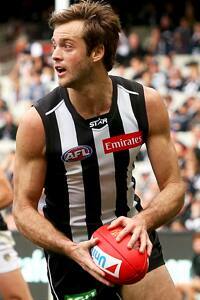 Macaffer and Toovey will play out the AFL and VFL seasons. The two surviving members of the 2005 draft intake embrace. Photo: Collingwood Media.